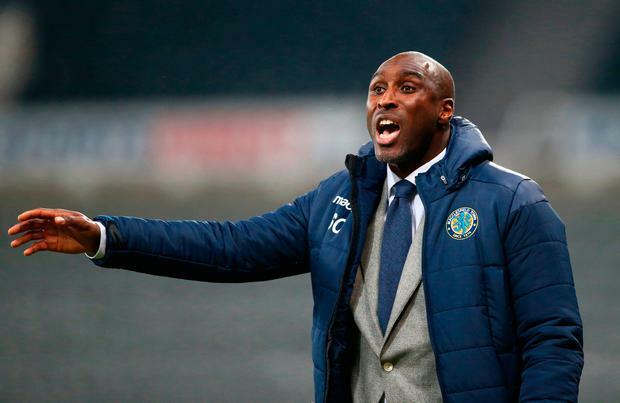 Sol Campbell was handed an early reminder of how tough management can be as the new Macclesfield boss tasted defeat to Newcastle in his first game in charge. The 44-year-old former Tottenham, Arsenal and briefly Magpies defender saw his League Two strugglers go out of the Checkatrade Trophy in a 5-3 penalty shootout defeat by Newcastle Under-21s after a 1-1 second-round draw in front of a crowd of 1,126 at St James' Park. Campbell, part of the England teams which lost on penalties to Argentina at the 1998 World Cup and Portugal at Euro 2004, made eight changes to the side which started in Exeter last Tuesday as he watched from the stands. Wearing a club coat over his suit, he was quickly on his feet after the game kicked off, setting up camp inside his technical area and barking out instructions - among them, "Box them in" and "Keep the ball" - which echoed around the sparsely-populated 52,000-capacity stadium. But the new manager suffered the first setback of his reign with 23 minutes played when Elias Sorensen and Callum Roberts evaded their markers with neat turns before Sorensen met Liam Gibson's cross and stabbed home the opening goal. If Campbell, who won 73 caps for England, was unimpressed as his defence succumbed on that occasion, he will have been even more annoyed with the way Roberts was allowed to dance through his rearguard two minutes later only for goalkeeper Kieran O'Hara to save with his foot. The former defender turned away in frustration once again when striker Scott Wilson went one-on-one with Magpies stopper Nathan Harker and lost four minutes before the break. His mood might also have worsened within seconds of the restart when Sorensen ran on to Keith Lowe's ill-judged back-pass, only to fire wide. Lowe saw a 73rd-minute header hacked off the line as the Silkmen pressed for an equaliser, and Campbell's evening improved markedly six minutes from time when Wilson made amends for his earlier miss to level, in the process sending the tie to penalties, although ultimately in vain.